Disney's Tarzan is a pretty fun movie to watch. It also raises some good questions about discussing adoption with an adoptee... you see, Tarzan is raised by Kala, but Kala's been putting off telling him that he's adopted. She finally gets around to it. A young married couple is shipwrecked on an island. They make a home for themselves and their infant son but are killed by a leopardess. Around the same time, a female gorilla named Kala loses her child to the leopardess. Kala hears the infant’s cries and rescues him from the leopardess. She names him Tarzan and chooses to raise him as her own son. Kala’s mate, Kershak, is the leader of the family of gorillas. He does not trust humans. He does allow Tarzan to stay after ascertaining that Tarzan was alone, but he establishes that Tarzan is not his son. Tarzan grows into manhood while being raised by gorillas and making friends with other jungle animals. He first encounters humans when he rescues a young explorer/biologist named Jane. Jane and her party want to find the gorillas, but Tarzan says he cannot bring them there; Kershak has forbidden it. Over time, though, Tarzan falls in love with Jane. He brings her and her party to his gorilla family. This angers Kershak, and he chases the party away. 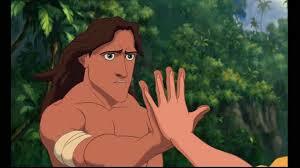 Jane is about to leave for England, and Tarzan decides to go with her. However, as soon as he boards her boat, several of her party capture Jane and Tarzan, lock them in a cell, and proclaim that they will go and capture the gorillas for profit. 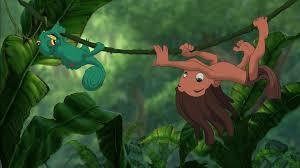 Tarzan is eventually freed and pursues them. Tarzan is able to save his gorilla family, but Kershak is wounded during the battle. Before Kershak dies, he apologizes to Tarzan, and says that Tarzan has been his son all along. Tarzan is given leadership in the tribe. Jane and her father decide to stay with Tarzan, and is welcomed by the rest of the gorillas. Tarzan is found and raised by a member of another species. Different members of his new family accept him to varying degrees; his mother accepts him fully, his father does not accept him; some children accept him as a curiosity, another accepts him as a best friend. Tarzan grows up knowing the language and culture of his new family and grieves that he is not more like those raising him. He is eventually introduced to his culture of origin. He meets another human and quickly learns his birth language. Tarzan’s gorilla mother shows him a photograph of his birth parents and lets him know that she just wants him to be happy. Tarzan affirms that the gorilla will always be his mother. He tries to integrate the two cultures. His initial efforts at integration are met with fear and rejection, due in part to the gorilla family’s fear of humans and the impure motives of some of the humans. Eventually, he is able to integrate his two worlds as two trustworthy humans (Jane and her father) are accepted by the gorillas. Tarzan’s story reflects some aspects of intercultural adoption. Some adopting families are hesitant to acknowledge the culture of their child’s origin; perhaps they do not know much about that culture, or do not view the culture as important. Some members of the adopting culture who have contact with the adoptee may dislike the adoptee’s culture, as Kershak seems to dislike Tarzan’s. Other members of the adopting culture may be well-meaning but insensitive, like one young gorilla who comments about Tarzan’s different appearance and asks about the whereabouts of his mother. When Kala says that she will be Tarzan’s mother, concern is evident on the faces of many other gorillas. A song which plays frequently during the movie includes the lyrics “two worlds, one family.” This is Tarzan’s wish and is also a good goal for multicultural families. Cross-cultural adoptees gain the culture of their adopting parents when they are adopted; they shouldn’t have to lose their culture of origin. Jane accepts Tarzan’s identification with his adoptive culture, remarking aloud that Tarzan is “one of them.” At one point, Jane tells Tarzan, “You belong with us.” Eventually, though, she chooses to join Tarzan in his culture while also educating him about hers. The movie shows strengths and weaknesses in each culture; some gorillas are open to Tarzan, others aren’t. Some humans are noble, others are ignoble. In any adoption, no culture is purely good, and no culture is purely bad. One culture is not better than another, and one shouldn’t be totally forsaken for another. After Kala shows Tarzan a photograph of himself with his birth parents, Tarzan asks Kala, “Why didn’t you tell me that there are creatures that look like me?” Tarzan has a very valid question, and Kala does not have a satisfactory answer. Kershak is the gorilla least pleased with Tarzan’s inclusion in the family. For much of the movie, Kershak appears to dislike Tarzan, telling Kala, “He’s not our kind,” and proclaiming that Tarzan is not his son. At one point, Tarzan relates how he interprets Kershak’s actions, telling Kala, “Kershak said I don’t belong in the family.” Although Kershak eventually apologizes and accepts Tarzan, the resolution is brief. 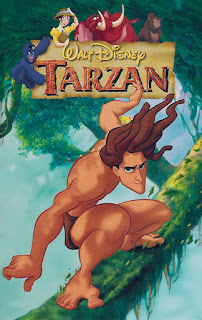 The evident dislike of Tarzan by his adoptive father could be painful for a child who does not feel close to an adoptive parent. A person adopted cross-culturally will likely have struggled (or sometimes still struggle) with feelings of not belonging in their new culture; Tarzan experiences overt rejection from Kershak and from some peers. Discussions about belongingness are probably a good idea; even if a child hasn’t expressed their struggles, they probably have experienced feelings of not belonging, either internally or through things others have said. Kershak’s dislike of Tarzan might be too poignant to focus on, but the mild unacceptance Tarzan experiences from his peers could be a good starting point for discussion. This is a musical Disney animated movie and will probably appeal most to children up to around ten years of age. The fact that the cross-cultural adoption is actually a cross-species adoption also makes it seem most appropriate for a younger audience. The movie seems appropriate for grade-school-age children who have been adopted cross-culturally and who are starting to have questions about their culture of origin, their place in their current culture, and the relationship between the two. The movie could be used as a way to begin a series of discussions with a child about culture; both the culture of their birth family and the culture of your family. Create a family culture which combines elements of each original culture. Parents watching the movie can try to identify with Kala: What is she feeling at various points in the movie? What does she do well? What can she do better? What do you know about where your birth family is from? What would you like to know? In the scene where Kala shows Tarzan the photograph of him with his birth family, how would you have answered Tarzan’s question: Why haven’t you told me before? How do you imagine Kala felt when Tarzan emerged in human clothes? If you have adopted cross-culturally or are considering doing so, how much do you know about the culture of the child? How can you learn more? Some adoptive parents have expressed that the child will inherit the culture of the adoptive family and should not need their own culture. How is this view harmful to the adoptee? Now that you've checked out Tarzan, it's time to see the surprisingly relevant sequel! Check out my adoption movie review of Tarzan II!